When you break a bone, the approach is to ensure that the broken pieces are put back into position and immobilized until new material forms and fuses with the surrounding tissue. Sometimes, it can be necessary for the orthopedic surgeon to put the broken bone in its original position. This procedure is referred to as reduction. Typically, fractures heal by knitting the two ends of the break together, as the new material forms around the edges of the break. However, the treatment for fractures is dependent on the location of the break and whether the fracture is open or closed. • Immobilizing Cast: A cast, usually made out of fiberglass or plaster of Paris, is molded around the break to keep it in the right position to facilitate healing. 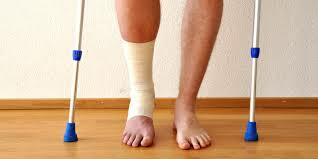 • Functional Cast: Sometimes, it becomes necessary to allow restricted movement of the neighboring joints. In which case, the doctors will use a functional cast to facilitate controlled movement of the joints. • Traction: Using a constant pulling action, the broken bone is put into position so that healing can take place. • External Fixation: Some injuries require more comprehensive treatment. Here, the doctor places metal screws and pins into the bone. These pins are positioned above and below the break and then joined to a metal bar that is placed outside, on the skin. This frame helps stabilize and align the broken bone until healing occurs. In case, the soft tissue is badly bruised and injured, just the external frame is used without the pins and screws until the tissue heals. • Internal Fixation: If the fracture is severe, and there are numerous fragments, the doctor will first position the broken fragments into place. These pieces are held using special screws and plates that are positioned on the outer surface. Alternatively, rods may be placed in the marrow space of the bone to keep the broken pieces in place. Depending on how severe the break is and how accurately the patient follows their doctor's advice, the healing can take anywhere from a few weeks to many months. The good news is that the pain will disappear long before it is completely healed. However, muscle strength in the affected area diminishes due to immobilization. This will require you to perform daily exercises to restore muscle strength and joint flexibility and motion.